It was smooth sailing for automakers during the month of May as new launches buoyed sales, spurred by robust retail demand on the back of continued economic recovery. 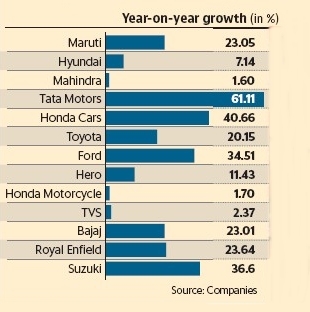 India’s top five carmakers, Maruti Suzuki India Ltd, Hyundai Motor India Ltd, Mahindra and Mahindra Ltd, Tata Motors Ltd and Honda Cars India Ltd, collectively sold 243,856 units during the month, up 20.6% from 202,187 units a year ago. Automakers in India consider dispatches to dealerships as sales. New model launches by five of the seven carmakers reporting sales led to a jump in numbers because they filled inventory channels. Passenger car market leader Maruti Suzuki’s domestic sales (excluding vans and commercial vehicles) jumped 23% to 144,780 units in May over the year-ago period, as the compact car segment led growth with a 50.8% jump to 77,263 units. The local arm of South Korean automaker Hyundai Motor Co. reported a 7.14% rise in sales to 45,008 units in May, on the back of next-generation models such as compact SUV Creta and Elite i20 hatchback launched during the month. The Grand i10 hatchback and Verna mid-sized sedan also continued to drive growth, according to Rakesh Srivastava, director of sales and marketing at the firm.